It was an amazing experience addressing the young crowd of upcoming entrepreneurs through #TEDxtalk at #ForeSchool of Management, New Delhi @ #NLP SubConscious ReImprinting on Jan30, 2016. 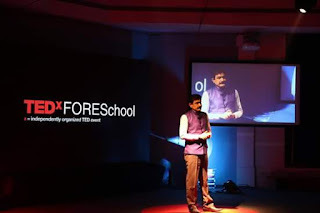 Other speakers in talk were #GauravMarya and #SanjeevKapoor. It was wonderful sharing the concept of #NLP in #business&success. While giving the talk, I laid the stress on three points; one, we should have an awareness as to what we want in life. This comes in visual and auditory mode in our mind. Is it enough? NO! Just having the awareness will not do. You need to have the second thing also. That is ‘permission’ form your heart. Permission defines the quality of sensations or feelings in your body. The more intensified feelings you have in your body about your goals, the more powerful signal you send to your body to take the action to achieve your outcome. Once you take the ecologically balanced permission from your heart, you need the third thing. And that is the physiological ability; means the ability of your body to complete that assignment. This is where the role of #fNLP SubConscious ReImprinting emerges. Through NLP SubConscious ReImprinting you can enhance the pictorial and auditory qualities of your goals in your mind and subsequently you can create the intensified feelings that will work as a motivator to you to achieve the impossible. It was learning, fun and ‘reference creating’ session that included NLP SubConscious ReImprinting training and ‘Firewalk’ attended by around sixty people on Jan 26, 2016 at Kanak Garden on Delhi-Chandigarh highway. Firewalk is just a five second event for you in which you will burn off your past negative beliefs, create a new self transformed image and build a new empowering future. These five seconds create the new empowering reference in you that if you can walk over the bed of coal burning at the temperature over 2000 degree Celsius you can do anything in your life. In life we human beings keep storing a number of disempowering reference and beliefs that usually program our minds for anxiety, frustration, depression, stress, failure and illness. A new ‘reference creating’ event like ‘Firewalk’ helps us to come out of our past limiting beliefs; also it helps us create new hope of achievement. If you have any past fears or limiting beliefs, Firewalk can be your emotional anchor to heklp you take your route to success and happiness. 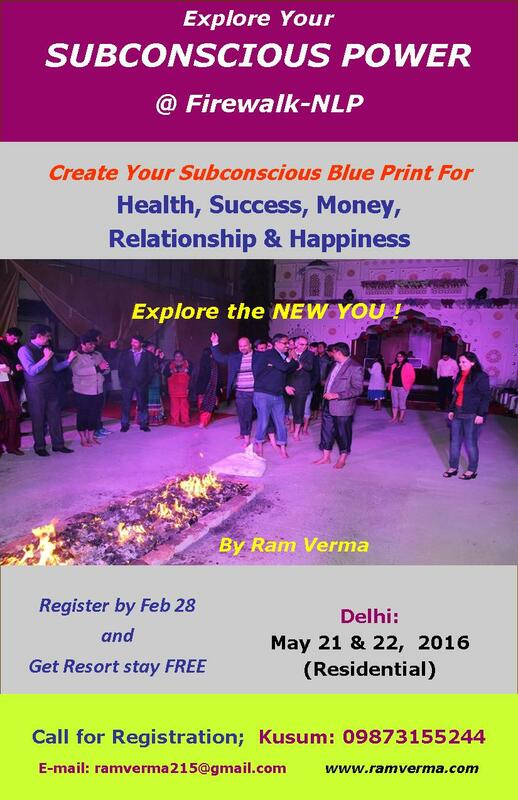 Next Firewalk NLP workshop comews up on May 21 & 22, 2016. 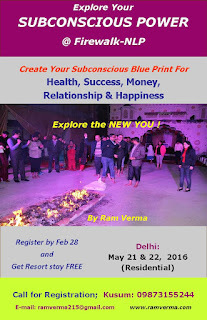 You can visit my website www.ramverma.com for further firewalk & NLP workshops. Recently, I met a girl of marriageable age having a unique pattern of falling sick or getting depressed especially at the time when her parents look for a match for her and the things start getting finalized. As soon, the girl find that she will be getting married soon, she fell sick or depressed. While talking to that girl using precise questioning called Meta Model in NLP (Meta Model is the language model of asking precise question and reach the heart of the challenge), I found that the girl is not comfortable to enter a ‘closed’ relationship where she find herself (in her visualization) in the ‘trap’. On further precise communication I found that the girl in fact suffers from some phobia of ‘being closed’ having no route to escape. As her subconscious mind sees pain in being in the ‘closed’ relationship, the subconscious mind adopts a method for avoiding that situation where the ‘fear of being in closed’ is experienced. And this results into a long term sickness, loss of energy, frequent mood-swing or depression. This fear is known as claustrophobia. Claustrophobia is the fear of having no escape and being in closed or small space or room. It can be the result of number of situations or triggers, like lift, crowded places, or offices/rooms having no windows. It is an anxiety disorder that could result into panic attack. As there is no fear in the awareness or consciously, but the subconscious distorts the situation as a ‘fearful’ one; and develops an experience of anxiety or panic even. Usually, the person may have had some past experience where he/she might have been trapped in some room, elevator or car etc. The imprints of that event have been lying in their subconscious mind vividly. The cure is to remove that event from the subconscious mind. This can be done through NLP SubConscious ReImprinting under the guidance e of an NLP coach. In this process, the person needs to get dissociated from the situation that occurred in the past and see it from a distance. Having anchored for safety, the person need to make those imprints blurred and meaningless either by seeing the moving getting rewound or creating the frames still. Also, you need to handle the sounds that may be lying in the subconscious mind and triggering the challenge. Once the intensity of the experience is reduced to four or less out of ten, you are sure that the pattern will not repeat. If it is more than four, you need to repeat the exercise. The advisable thing is that while handling claustrophobia, you had better visit any NLP coach so that he can guide you well in case the patterns of anxiety surface. In case, you face this type of fear, it may hamper you from entering not only from ‘closed’ physical spaces like rooms, office and lifts but also ‘closed’ metaphorical spaces like ‘marriage’, ‘business deals’ or ‘personal commitments’.